ADAM: Given that Ziva was one of three agents who resigned to protect Gibbs, it actually won’t be that far-fetched. The season will open with a two-parter that features Colin Hanks returning to threaten Gibbs, prompting a team reunion. “Ziva is out in the ether and Tony has to go off and find her,” executive producer Gary Glasbgerg says. “The second episode is really all about Tony and Ziva, and, I hope, delivers all the things the Tiva fans are going to want.” Adds Michael Weatherly: “The will they/won’t they is answered. Tony’s going to be forced to face this Sword of Damocles that’s been hanging over him since Season 3.” That’s Greek for “they’re totally gonna do it,” right? NATALIE: With Isabel Rochev, Sebastian Blood and Bronze Tiger being introduced — and Deadshot and Slade Wilson returning — the possibilities are endless! “Our two Big Bads of the year, we know what their endgame and master plan is,” executive producer Marc Guggenheim says. “[They’ll both] feel like they’re acting from a righteous place. They will cross paths, and there’s a Venn diagram in terms of their goals and in the diagram, there is overlap.” Who do you put your money on? ADAM: Don’t expect the crazy roller coaster you got at the beginning of Season 2. Instead, Season 3 is a measured exploration of the aftereffects of the Langley attack on Carrie, Saul and the Brody family. It’s fair to say that they’ll all be unnerved — in different ways. Saul will have to choose between Carrie and the CIA, which is heartbreaking, and Dana will take drastic action that will reveal a new side of her character — literally and figuratively. NATALIE: While we won’t rule out the opportunity for crossover episodes, Claire Holt seems pretty sure that the two are done for now. “In the last episode, Matt told her, ‘I have to keep my life vampire-free,’ so she knew going into it that they would have a little fun, travel the world together and now she’s ready to move on and take down more men in New Orleans,” Holt says. Ausiello: Well, when you ask in such a polite fashion, how can I say no? A new thirtysomething character, Trey, is going to be hot, rich, charming, confident, self-deprecating and European — which narrows his romantic pool to Juliette, Scarlett, Zoey, Will or anyone with a pulse. Ausiello: Gypsies are known for their nomadic nature, but Queen Estefania is staying put… at least for now. Executive producers James Kouf and David Greenwalt tell TVLine that Emmy winner Shohreh Aghdashloo will appear in at least a few episodes of the NBC drama’s upcoming third season. Ausiello: The show is about to stage a kinda-sorta Saved By the Bell reunion. In an upcoming episode titled “Need to Know,” the cast of an early-’90s sitcom called 2 Cool For School is reassembling for a new movie when — egad! — its version of Screech is offed! For the first time in all of the years I have been attending the San Diego Comic-Con (that would be 12 years in case you were wondering), I attended the independent film festival, which has been a juried event contained within the annual fete since 2005. The four-day festival screens some of the very best in genre-related short and long films as part of Comic-Con. The festival’s categories include action/adventure, animation, comics-related, documentary (pop culture related), horror/suspense, humor, and science fiction/fantasy. The winners of each category are decided by a panel of judges made up of film and popular arts industry luminaries; this year that included actress Kathy Najimy, Entertainment Weekly columnist (and former LA Times writer) Geoff Boucher and filmmaker Alex DeMille. Trophies and prizes are given to the films deemed by the judges to be the best in each category, and an overall “Judges’ Choice Award”, which is presented to the one film considered the best film in the festival. After the initial screening of “Just Us Guys” during the festival, Chris took to the stage along with his film editor Clinton Steeds (That’s So Raven and Cory in the House) and writing consultant Mark Litton (Mighty Morphin Power Rangers) to participate in a moderator Q&A. Chris was first asked what the genesis of “Just Us Guys” was with his reveal being that he wrote a horror script similar to that of Buffy, the Vampire Slayer back in 2009; and then he ended up writing a pilot that was Gilmore Girls but with guys inspired, which is what eventually became “Just Us Guys”. 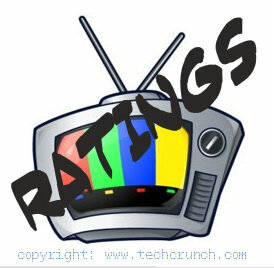 When talking about what viewers of the online series can expect next, Chris shared that he is working on how to tell the full 13 ten-minute episodes for season two of “Just Us Guys” that will be more comedic and more father-son-based. And, he also shared that Elsie (played by Phylicia Goings) – who is the dynamic new comic book store employee – is actually being prepped as a spin-off series. Mark and Chris then shared how they came to know each other, and it was through the Mighty Morphin Power Rangers, which was the show that changed Chris’s life, making him want to work in the industry. In fact, Chris named his production company – 82893 Productions – after the date that changed his life. 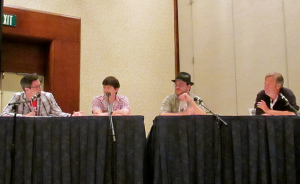 When the awards ceremony was presented on the last day of the convention, “Just Us Guys” was – unfortunately – not among the winners of the categories listed above, but when asked how he felt about the results, Chris was positive, sharing that he was already a winner by having his online series selected as part of the festival, getting great exposure and having the opportunity to network with everyone who participated in the Independent Film Festival. 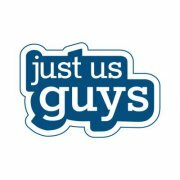 To learn more about 82893 Productions as well as “Just Us Guys”, make sure to visit their official website here, check them out on Facebook here, follow them at Twitter @justusguystv and @82893Prods and check them out on You Tube here. ADDED: You can also follow Elsie The Series on Twitter @ElsieTV and on Facebook here.